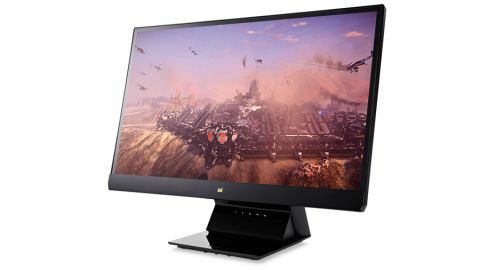 The budget end of the monitor market is suddenly rife with quality 23- to 24-inch 1080p screens with cheap IPS panels in them. You've got to love the fact that you can pick up a full HD screen running one of the best monitor technologies out there for just over a ton. It certainly makes a huge difference compared to the weak, washed-out 24-inch TN panels we were once grateful to pick up for around £200. We were utterly smitten by the outgoing VX2336s-LED, and have been recommending it in our Rig Builder pages for months - and to our friends and family too. These bargain IPS monitors aren't running the tippety-top of IPS panel tech, generally eschewing the high-end 10-bit or 8-bit colour per channel screens for the cheaper 6-bit technology. Realistically though, you're unlikely to be able to tell the difference unless you're a photographic guru. The old VX2336 used a lower-end 6-bit screen, but this upgraded option is pushing that up to 8-bit on the specs list. The colour definition isn't the only thing that's been upgraded. Viewsonic has created a monitor that's superior in many ways to the previous, now-dead king. Long live the new king. The first difference you'll see is in the chassis surrounding the panel. Last month I checked out the AOC i2757fm, with its barely perceptible bezel, and this Viewsonic screen is either copying very closely or, more likely, is buying in this IPS panel from the same Far Eastern factory. Again, the bezel is invisible when the screen is powered down, and is set flush to the panel itself. When the screen is on, that bezel is around 12mm at most, with a thicker band along the bottom edge of the monitor. Unlike the AOC screen though, the controls aren't laid into that thicker lower bezel; instead they're set into the wide stand/base that holds the whole thing up. The stereo speakers are inside that base, but sadly thatfs the only vaguely positive thing I can say about it. When you're sat at the desk the controls are totally out of sight and reach, making it a pain in the spine to alter settings on the fly. It's tilt-only, like most budget screens, so there's no alleviating the issue. Because the controls aren't on the screen itself it offers no VESA-mounting compatibility, which is a shame as the thin bezel would lend itself well to a multi-monitor bracket. But those are the only negatives I can see in the VX2370. The image quality is excellent, and it's hard to tell that the response time is a relatively sluggish 7ms. It's got the great IPS colour accuracy and viewing angles, although you'll need the brightness and contrast settings up high to make it really pop. Doing so does start to affect the white levels, and there is a certain amount of colour banding, but it's barely perceptible in normal use. Minor issues with the stand and tilt-only positioning aside, this is an excellent screen for the cash, and I'd have no problem recommending it for your next budget-focused PC build.